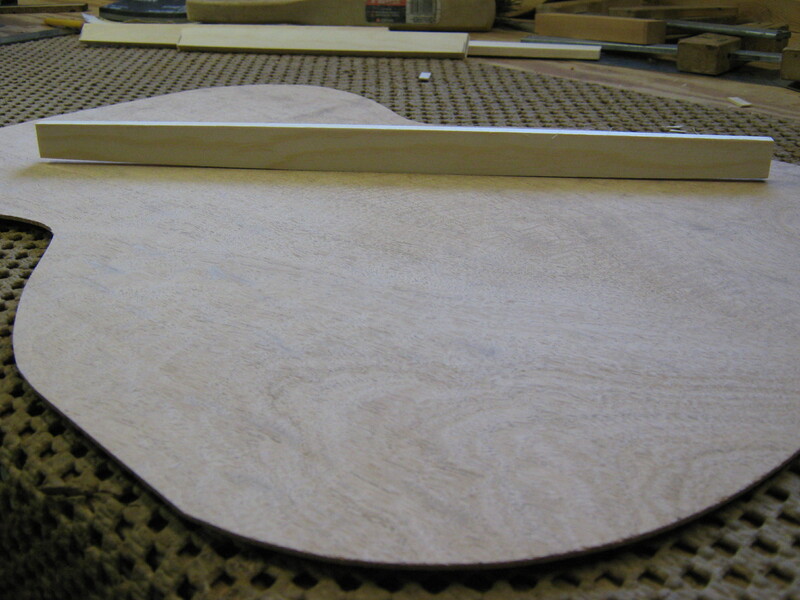 The back of this guitar, like the sides, will be made of figured Honduran mahogany. The first task is to join the two halves of the back. There isn’t going to be any sort of decorative center strip covering the seam of this guitar, so the joining of the two halves must be very clean because any small defects will be visible. 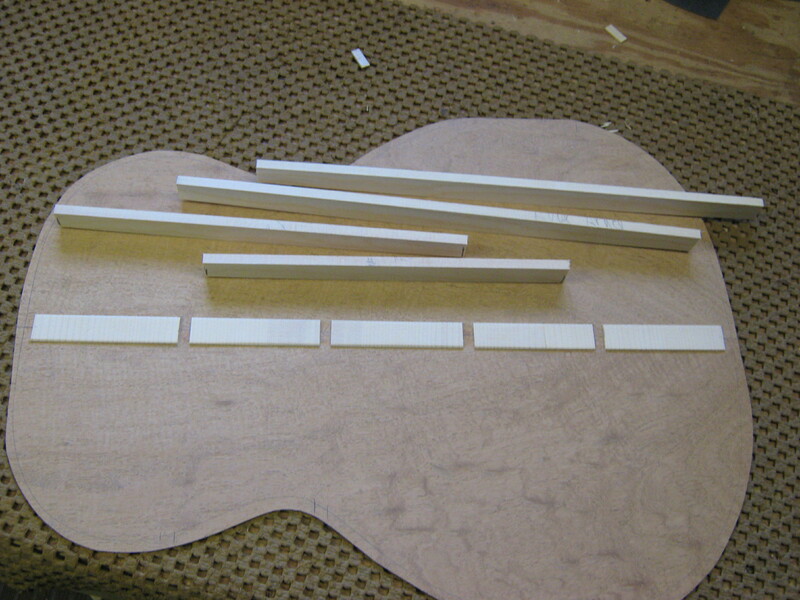 In the photo below, the two halves are on the workboard ready to be joined. The wood has some superficial discoloring from being stored for several years, but that will all be sanded away. At the very bottom of the picture you can see some paired wedges of wood. The wedges closest to the mahogany are slid along their mates to apply the necessary clamping pressure to the two halves of the back. 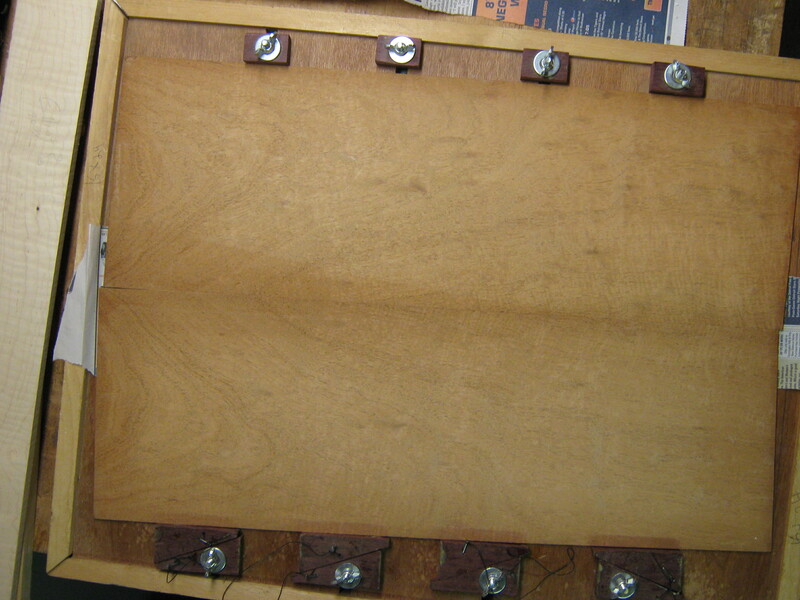 After the glue dries, the back is scraped and sanded to its final thickness–about 0.080″ inches. 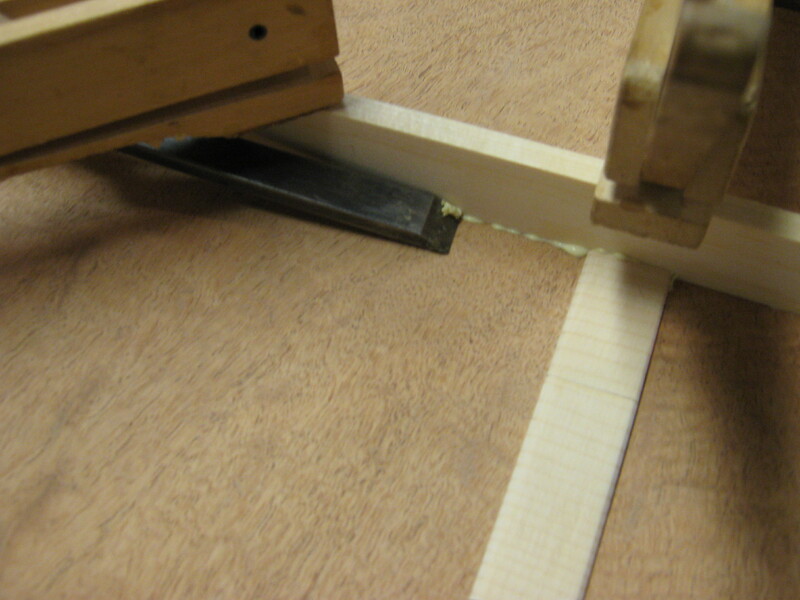 A thin strip of spruce with grain running perpendicular to the center seam is glued in as a reinforcement. After the braces are made, the center reinforcement is notched out and the braces are glued in place. The specific location of these braces is what was marked on the drawing of a Stella guitar that I have been working from and from my inspection of a Stella guitar before I started the project. I find Stella’s choice for brace locations to be interesting. Most of the guitars I’m familiar with, and certainly all of the ones I have built with four back braces, have a brace exactly at the widest part of the upper and lower bouts, and at the narrowest part of the waist, with the fourth brace about half way between the waist and the lower bout brace. The Stella braces are all oriented farther back, toward the tail end of the body. This is starting to seem like a good idea to me: it spaces the braces evenly and does not leave such a large unsupported area behind the last brace and the tail end of the guitar. As the braces are clamped, excess glue is cleaned up with a chisel. I don’t want any unsightly globs of dried glue inside the guitar any more than I would want them on the outside. It’s easier to deal with excess glue before it has completely hardened.